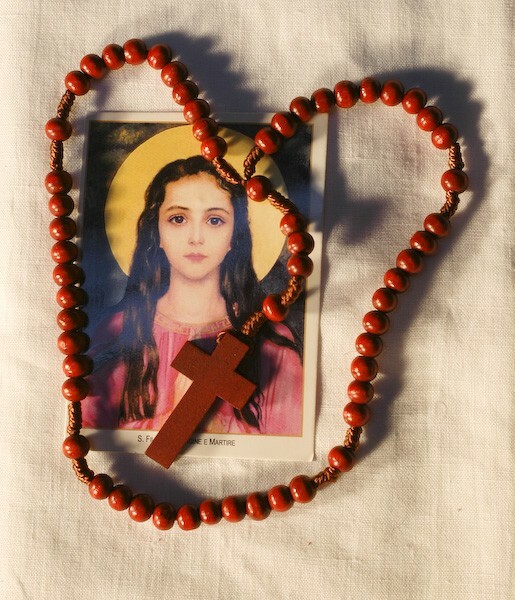 3 x Wooden Marian rosary beads with St Philomena picture. Rosary beads, from the Latin rosarium meaning garland or bouquet of roses, is a string of beads and a crucifix. The Rosary begins with the Apostles Creed, followed by one Our Father, three Hail Mary prayers (traditionally offered for an increase in faith, hope, and charity for those praying the Rosary), a Glory Be, and, if desired, the Fatima Prayers. Next come five mysteries, each consisting of one Our Father, ten Hail Mary prayers, a Glory Be, and, if desired, the Fatima Prayers. Conclude with the Hail Holy Queen. © 2014 Shop Philomena. All Rights Reserved.